Many believe Rene Caisse (pronounced "reen case") is one of the greater heroines of the past century. 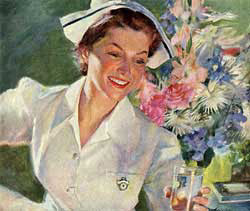 This modest Canadian nurse discovered a natural herbal forumla she took no money for it and died in relative obscurity. Rene didn't feel herself a writer so she never wrote an autobiography. She did, however, write a series of articles entitled "I Was Canada's Cancer Nurse" which was published in the seventies with Bracebridge Examiner. 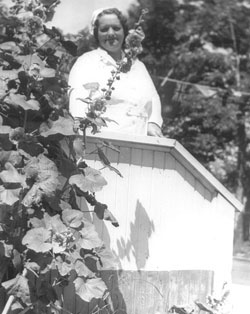 Additionally, a collection of her writing and interviews was published posthumously in the Bracebridge Examiner. In the 1920s Rene encountered a prospector's wife who survived breast cancer. She tells it here in her own words (click here). The initial use of Essiac was encouraging, so much so that a group of doctors assisted her in setting up a test lab and clinic in Toronto. She tells it again here in her own words (click here). She was invited by the Bracebridge Town Council to open her clinic in the old British Lion Hotel. Her lease payment, as stipulated by the Council, was $1 per month. It was here she ran her clinic from 1934 to 1942. She tells us in her own words (click here). Even before she opened the clinic, the medical establishment viewed her with skepticism. With the clinic now open, the full weight of the establishment unrelentingly bore down on her for years to come. Her own words: click here. Rene Caisse in her familiar white nurse's uniform. "A Tribute to Nurse Rene Caisse"